Good afternoon guys. In a follow up to a previous query which was very much solved by QHarr, I was wanting to run the solved query against multiple fields from the source code rather than just one. Anyway, each field would ideally be in a row right of the ticker used for the stock. The code below works for the given test cases. With much longer lists please see the ToDo section. You want to look into an API to provide this info if possible. 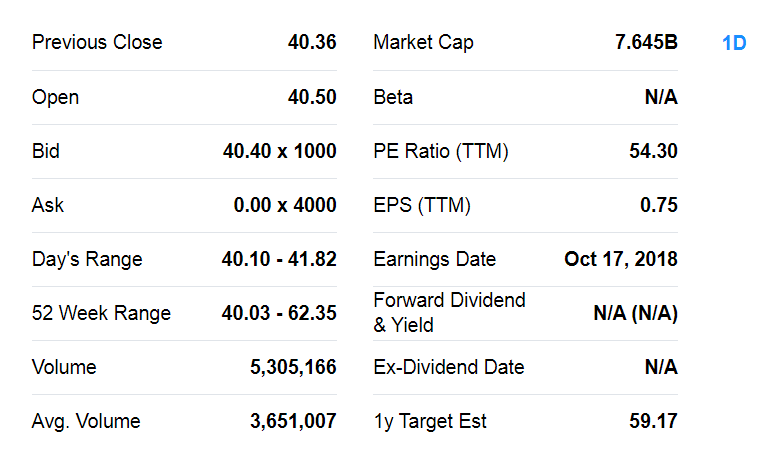 I believe Alpha Vantage now provide info the Yahoo Finance API used to* . There is a nice JS tutorial here. Alpha Vantage documentation here. 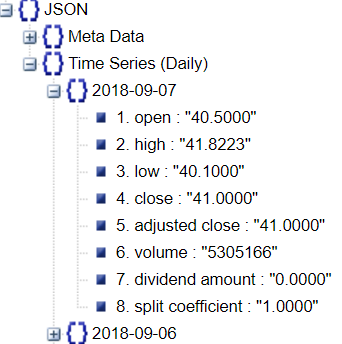 At the very bottom of this answer, I have a quick look at the time series functions available via the API. With an API key, you can also potentially use the webservice function in Excel to retrieve and parse data. Example here. Not tested. However, I will show you a way using a class and a loop over URLs. You can improve on this. I use a bare bones class called clsHTTP to hold the XMLHTTP request object. I give it 2 methods. One, GetHTMLDoc, to return the request response in an html document, and the other, GetInfo, to return an array of the items of interest from the page. Using a class in this way means we save on the overhead of repeatedly creating and destroying the xmlhttp object and provides a nice descriptive set of exposed methods to handle the required tasks. It is assumed your data is as shown, with header row being row 2. The immediately obvious development, IMO, is you will want to add some error handling in. For example, you might want to develop the class to handle server errors. The class method of GetInfo extracts the info from each webpage using a css combination selector to target the page styling. Rather than mess around with multiple tables I simply target all the table cells, within table body elements, with a selector combination of tbody td. The CSS selector combination is applied via the querySelectorAll method of HTMLDocument, returning a static nodeList. The returned nodeList items have headers at even indices and the required data at odd indices. I only want the first two tables of info so I terminate the loop over the returned nodeList when I gave gone twice the length of the headers of interest. I use a step 2 loop from index 1 to retrieve only the data of interest, minus the headers. 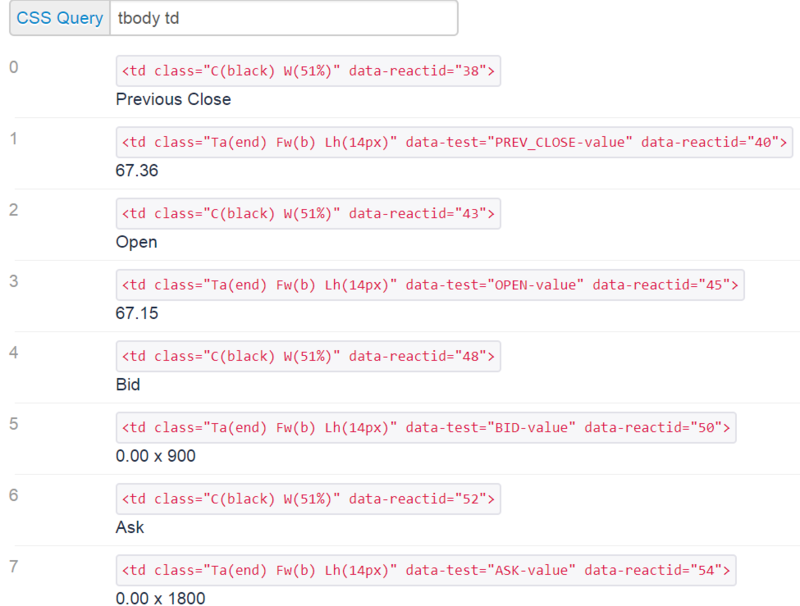 A little digging through the documentation will unveil whether bundling of tickers is possible, I couldn't see this quickly, and whether more of your initial items of interest are available via a different query string. You can parse the JSON response using a JSON parser such as JSONConverter.bas and there are also options for csv download. * Worth doing some research on which APIs provide the most coverage of your items. Alpha Vantage doesn't appear to cover as many as my code above retrieves. That's some slick code!! I like it a lot!! As an aside, you may want to consider using R to do this kind of thing. Look at what you can do with just a few simple lines of code! Not the answer you're looking for? Browse other questions tagged excel vba excel-vba web-scraping excel-web-query or ask your own question. 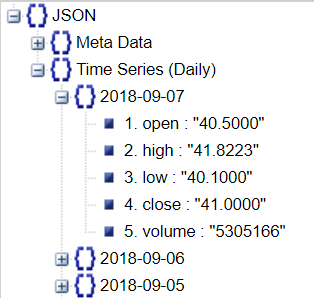 How can I parse data using VBA-JSON with number range in URL?